Chris Cape led the Blackhat Humane Society in Gallup, N.M.
Chris Cape, president of Blackhat Humane Society, died Monday in a two-vehicle crash on Colorado Highway 140, about 6 miles north of the New Mexico state line. The animal rescue community on the Navajo Nation, where there are an estimated half-million stray dogs roaming the vast desert landscape, just lost one of its most selfless, staunch advocates. Earlier this week, the Southern Ute Indian Tribe reported that a woman was killed in a two-vehicle collision Monday night on La Plata Highway (Colorado Highway 140), near the New Mexico state line. The tribe refused to release any other details about the crash, as well as the woman’s name. In the days since the crash, however, social media has flooded with support and condolences for the loss of the woman, who has been identified as Chris Cape of Gallup. 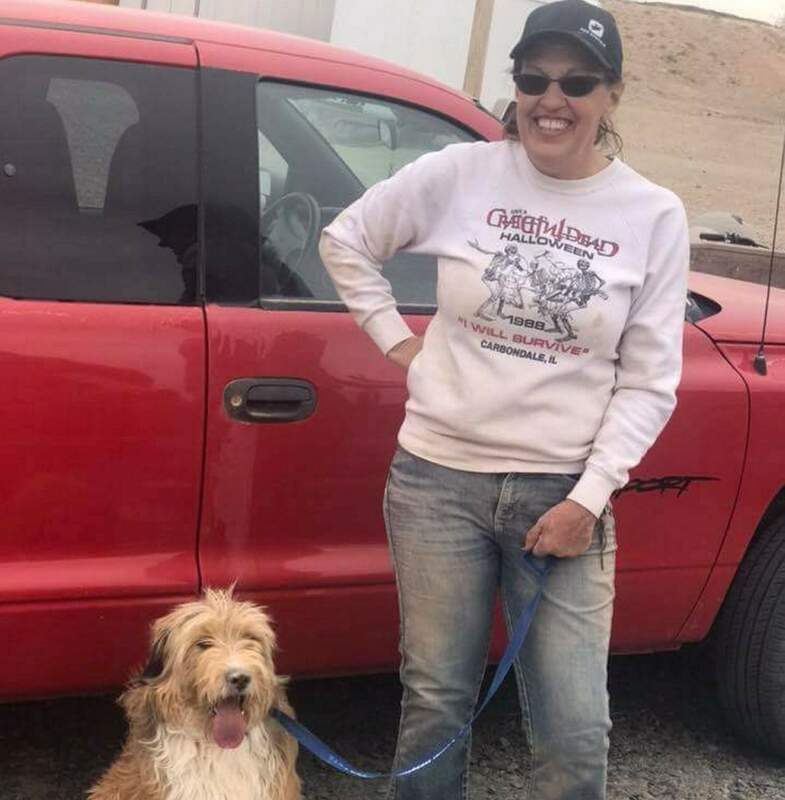 Cindy Yurth, vice president of Blackhat Humane Society, who is also a reporter for the Navajo Times, said Cape, president of Blackhat, was on her way home Monday night from Durango to Gallup. Cape had spent the day trying to adopt out two dogs to families in Durango. She was successful with one of the dogs, and then went to have dinner with her daughter who lives in Durango. The crash occurred on her way home, shortly before 11 p.m., about six miles north of the state line. The other dog, named Bingo, that wasn’t adopted that day survived the crash, and is currently at the La Plata County Humane Society. “That’s all she knows,” Yurth said. A spokeswoman for the Southern Ute Indian Tribe did not answer questions seeking additional information about the crash, including cause and who is at fault. Lindsay Box, spokeswoman for the tribe, wrote in an email that the tribe is unable to comment on the cause of death until an autopsy is complete. Cape’s death has had reverberating effects on the animal rescue community in and around Gallup, Yurth said. Cape grew up in the Midwest, but moved to the Four Corners sometime in the early 2000s. It’s unclear how old she was when she died, but friends estimated Cape was in her late-40s. Friends said Cape worked for a time as a special-education teacher at Sanders Valley High School in Arizona, about 45 miles southwest of Gallup, all the while volunteering at Blackhat Humane Society and rescuing dogs on the reservation. On the Navajo Nation, a 27,000-square-mile reservation the size of West Virginia, which spans Arizona, New Mexico and Utah, stray dogs are a rampant problem, with many carrying diseases and even attacking people. For the most part, the problem goes unchecked. It’s a common occurrence to see a dead dog on the side of the road that likely died of hunger or was hit by a car. Historically, most reservation shelters opt to euthanize. Cape worked tirelessly to give those animals a second chance at life. A couple years ago, Yurth said Cape’s mother died, and left her an inheritance, which she used to quit her job as a teacher and rescue dogs full-time, eventually becoming president of Blackhat Humane Society. Cape then bought property in Gallup with the hope of starting a rodeo that would also help fund rescue efforts. Yurth said Cape’s death leaves a hole in Blackhat Humane Society, and the nonprofit is unsure how it will continue without her tireless efforts. “We need a lot of help, that’s the only way we can continue,” Yurth said. Cape’s legacy, friends agreed, is the countless number of dogs, as well as cats, she’s saved over the years. In Durango alone, Yurth said there are probably more than 100 people with animals from Blackhat Humane Society. “It’s a big loss for everybody,” Hermann said. Chris Nelson, director of animal services for the La Plata County Humane Society, said that Bingo, the dog that survived the crash, is on hold, pending a possible adoption.